KAMPALA– Uganda people’s defence forces (UPDF) has launched its own brand of condoms. Named after the Swahili word, Ulinzi, to mean protection– the condom is aimed at preventing soldiers from contracting HIV. “A soldier cannot defend his country if he “does not ensure that he’s safe,” said Chief of Staff Brig Leopold Kyanda at the launch of Ulinzi condom. Nearly six percent of adults in the country are living with HIV but strides have been made in reducing the number of new infections. In the past, the UPDF was known to have a high infection rate. 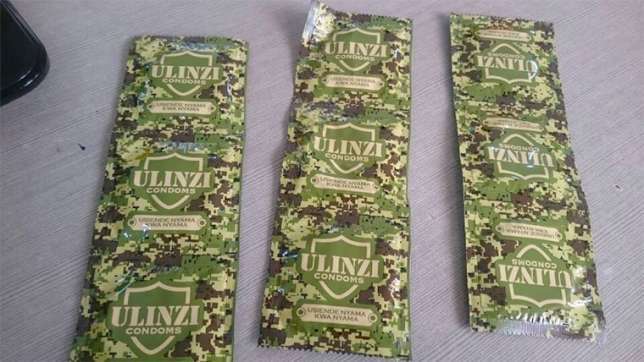 “The Ulinzi condom, which comes in a camouflage packet, should help stop soldiers bringing HIV back home after a tour of duty,” said the ministry of health’s Vastha Kibirige. “They have to protect their lives to avoid infecting their wives back home,” Kibirige told journalists during the launch. Aids-related deaths in Uganda peaked in 1999 at 74,000 people per year but have declined since then, UN reports read. The fall in the death rate can be put down to more prevention campaigns as well as greater access to Anti Retro Viral (ARVs) drugs that help stop the growth of the virus in the body.